The tulip is a perennial, bulbous plant with showy flowers in the genus Tulipa, of which around 75 wild species are currently accepted and which belongs to the family Liliaceae. The genus's native range extends west to the Iberian Peninsula, through North Africa to Greece, the Balkans, Turkey, throughout the Levant (Syria, Israel, Lebanon, Jordan) and Iran, North to Ukraine, southern Siberia and Mongolia, and east to the Northwest of China. The tulip's centre of diversity is in the Pamir, Hindu Kush, and Tien Shan mountains. It is a typical element of steppe and winter-rain Mediterranean vegetation. A number of species and many hybrid cultivars are grown in gardens, as potted plants, or as cut flowers. 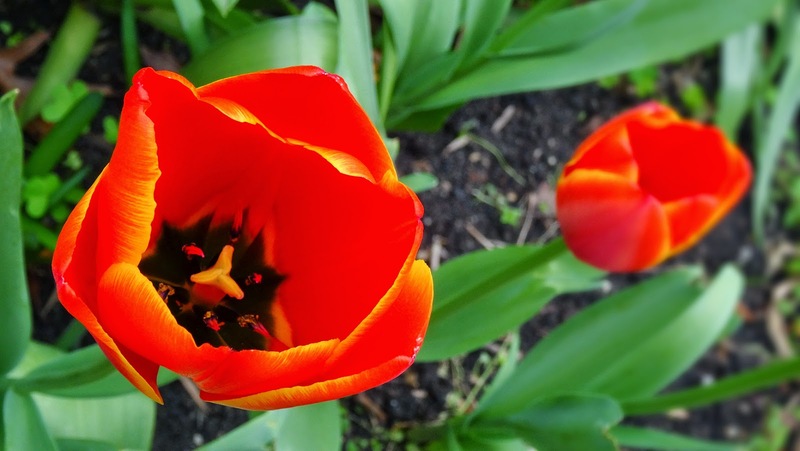 Tulips are spring-blooming perennials that grow from bulbs. Depending on the species, tulip plants can be between 10 cm and 71 cm high. The tulip's large flowers usually bloom on scapes with leaves in a rosette at ground level and a single flowering stalk arising from amongst the leaves.Tulip stems have few leaves. Larger species tend to have multiple leaves. Plants typically have two to six leaves, some species up to 12. The tulip's leaf is strap-shaped, with a waxy coating, and the leaves are alternately arranged on the stem; these fleshy blades are often bluish green in colour. Most tulips produce only one flower per stem, but a few species bear multiple flowers on their scapes (e.g. Tulipa turkestanica). The generally cup or star-shaped tulip flower has three petals and three sepals, which are often termed tepals because they are nearly identical. These six tepals are often marked on the interior surface near the bases with darker colourings. Tulip flowers come in a wide variety of colours, except pure blue (several tulips with "blue" in the name have a faint violet hue). Beautiful shot of these intensely colored flowers! I've learned that the secret to growing tulips is to pay attention to where they developed, in steep, dry summer areas, and withhold water in the summer. Otherwise they rot, but if they have good drainage and are not watered in the summer, they do naturalize. Really great photo ! I love tulips ! One of the first flowers I was taking photos of were Tulips, love this photo! Keep up, you're great! I really like this one, would you like to follow each other? Let me know!